Register Log In GliderCENTRAL Forums Diet & Nutrition Diet & Nutrition 101 Misc Approved Diets? I have been a member of this board and several others for a while now. There has always been talk about "approved" diets. I jumped right on the bandwagon and would talk to newer people of "approved" diets as well. I believe that it is very important to have your gliders on a nutritionally sound diet and I will spare no expense in making sure my gliders eat healthy. Don't get me wrong! I am just very curious about one thing. WHO approved these diets? After all, for the most part, these are not the diets that exotic vets will suggest when you walk into their office. I would love to hear who "approved" the ones that are talked about here. I would also like to know why other diets are not approved. What are the criteria used? Thank you so much! Personally I don't know much about who approves diets or why, but my personal opinion is that because they are exotic and live in the wild, they need a certain amount of everything that they would be eating if living in the wild. Some diets such as a pellet only diet really is only fatty and has protein, but just like us, they need other nutrients to live. We can't live off of peanut butter and bread. This is an interesting question and maybe I would as well get some insight and see if my theory is close to the actual reasoning. I believe the approved doesnt mean it was "approved" by a person.. I believe it actually means PROVEN. As in it is proven to be healthy and nutritionally sound. Well, if this is the case then why isn't LGRS approved? Why isn't Val's Green Variety diet approved? Those two are both used by people as well. The funny thing is that many pellets are used by a ton of owners as well and their gliders are alive. Are they as healthy? I don't know. I know some are definitely not. Peggy has taken steps to get her HPW Plus and HPW Complete diets tested so vets are now feeling good about suggesting them so I feel comfortable with them. Other vets who haven't been introduced to Peggy's two diets usually suggest diets that are listed in the Quesenberry vet Reference manual. Those are diets that they feel comfortable suggesting because there is some data on them. So, why are the 'approved' diets suggested here not any of those...aside for Peggy's HPW Plus and HPW Complete? Let's keep discussing! Love it! Oh and I do agree Tina, they should have a nectar source as a primary part of their diets. I haven't seen any Pellet trees in the wild. However, I also agree that they need something crunchy for their teeth since most people don't offer tree limbs for them to tear bark from. I use the word "recognized" when I post to people about diets - never approved - and I do agree that it's the wrong word to use. Aimee, my point exactly! I think that word is misleading and shouldn't be used. Thank you! Yep. I know that there was a thread somewhere about this before...I'll have to look, because this isn't the first time it's been discussed. It's even my understanding on Peggy's diets that although they've been tested and worked on by nutritionists, they are also not "approved". Yes, there are a few vets now that are using it in house and selling it for her, so she is able to say that it's vet approved...but unless I'm mistaken, it is not approved by the Food & Drug Administration, no different than Val's, LGRS, etc. This is in no way a bash or put down of ANY of the diets...I'm simply agreeing that we need to be careful in which words we choose so that people aren't confused. That actually makes more sense saying proven instead of approved. I use pellets for them during the day and a little at night in case they are still hungry after the main part of their diet. But proven where and by whom? Years and years of data must be collected for something to be considered proven to do "something", whether it be positive or negative. It's even my understanding on Peggy's diets that although they've been tested and worked on by nutritionists, they are also not "approved". Yes, there are a few vets now that are using it in house and selling it for her, so she is able to say that it's vet approved...but unless I'm mistaken, it is not approved by the Food & Drug Administration, no different than Val's, LGRS, etc. Actually, the FDA doesn't control or approve animal diets. They are watched by AAFCO (Association of American Feed Control Officials). It is my understanding Peggy's diets are manufactured at an approved AAFCO manufacturer so, in essence they are truly the only "approved" diets in that respect. HOWEVER, most diets are not actually manufactured. So that cannot apply to those diets where people are combining ingredients in their own homes. I believe that Peggy's diets will be in the Quesenberry Manual well before any of the others most people talk about simply because she is so far ahead of others in the testing arena and that is what vets who write the manuals for other vets look at. I am definitely not trying to bash here either. I just think it's important that new owners, no all owners realize that there is no magic pill. "Approved" doesn't mean what they may believe. I also think it's important that people look at the fact that we haven't had gliders here in the US for that long when you look at the big picture. Several great people are working to find diets that are healthy for our gliders. I had to giggle the other day. I got a book about sugar gliders in a box of things from a friend. The book title is "Sugar Gliders A Complete Pet Owner's Manual". It is by Caroline MacPherson and has 50 color Photos in it. The copyright is from 1997. In many of the pictures the adult gliders are very stained. It is apparent because the joeys hanging on backs of stained moms are beautiful grey joeys who haven't been subjected to the diets that their parents are eating so are not stained yet. I have no doubt that these gliders are as healthy as any that were being raised at the time and that they are loved. I just want to raise awareness here. That is all! Tina, I'm definitely playing devil's advocate here. Don't get me wrong. 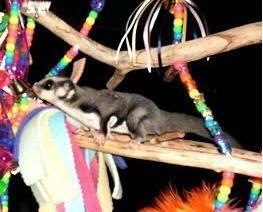 The majority of sugar glider owners do not frequent web boards. Many feed pellets and they seem to have gliders that are alive and well. How well, I don't know. So "proven" is definitely subjective as well. That is true. I guess it depends on a persons opinion of "proven" or "approved". That is why I think it is hard to discern here for new people because some believe that there are certain diets that are the only ones that a glider can live on in a healthy way. I would still love to know why certain diets are the one listed here? If you go to the diet & Nutrition section there are only a handful? Anyone? Personally I like using the word "proven" when it comes to diets and there is only a small handful that I would consider "proven". I like the term because to me it is time tested diet that has "proven" to be healthy for our gliders. THOUSANDS of gliders have thrived on this handful of diets for many years. Yes, proven is much better than approved. I think proven around GC probably means we don't see a lot of people who use a specific diet coming on the board talking about glider health problems. Whether this reflects reality or not probably depends on how long the diet has been around. Or maybe it's the reverse? People who *do* come on GC and talk about health problems seem to be using a diet that's *not* listed in the "proven" diet section. If it's true that "all pellets are bad", I'm pretty sure a lot more people would be on this board talking about health problems associated with the SunCoast diet, or complaining about how terrible the gliders they purchased from us look! The diets listed on SugarGliderHelp are entered by individuals and "approval" or even being proven is not required. There are other diets that are NOT listed on SugarGliderHelp including HPW Plus and HPW Complete because Peggy chose not to list them there. I'm using suncoast right now but took out the pellets and my gliders staining went away alot. I'm going to be switching to bml when I can go get the stuff for it next weekend. Perhaps acceptable would be a better word? I can say my diet is "approved" by 3 different vets. I can say that for ME, it has "proven" itself in the 7 1/2 years I've been feeding it based on the health of the gliders, the health and good weights of the joeys born here and the long lives my gliders have and based on the number of gliders it has been fed to that have thrived on it. But, at the same time, I've never had it chemically and nutritionally analyzed by a lab. For me, I want to see the LONG term effects of a diet. How do the gliders do on it LONG term (say 5 years plus). Many of the diets being suggested to people haven't "stood the test of time" to me. After all, look at how many "approved" drugs are now being recalled (at an alarming rate) because of the potential for side effects and death. I don't take any "medication" that hasn't stood the test of time either! Dancing what diet do u use? Actually, the FDA doesn't control or approve animal diets. They are watched by AAFCO (Association of American Feed Control Officials). It is my understanding Peggy's diets are manufactured at an approved AAFCO manufacturer so, in essence they are truly the only "approved" diets in that respect. I've been talking with various government agencies recently about the manufacturing and packaging of pet foods. To be AAFCO approved, they have to be PACKAGED in an AAFCO approved facility. They state it is because there is possibility of contamination during transport between manufacturing and packaging and needs to be tested at BOTH levels. So no, they are not AAFCO approved. HOWEVER, most diets are not actually manufactured. So that cannot apply to those diets where people are combining ingredients in their own homes. I believe that Peggy's diets will be in the Quesenberry Manual well before any of the others most people talk about simply because she is so far ahead of others in the testing arena and that is what vets who write the manuals for other vets look at. They are not far ahead of others. I am 5 years into a diet study. Know why you don't see mine out there yet? It takes more than 5 years to get a full diet study to be placed in any sort of "manual". That takes 10 years and countless government agencies. They are not far ahead of other people. Other people just don't want to release an untested product. Not bashing, just stating facts. PocketPrincess, I'm not trying to make light of your work on your diet either. Your isn't being manufactured anywhere, right? Therefore, I am going to presume it won't fall under the AAFCO regulations. I agree that the testing takes a very long time and yours could very well be in the vet reference manuals before Peggys. My apologies! Please tell me PocketPrincess as you may know since you are doing so much research. Regarding the four (I believe that's the correct number) diets that are listed in the Quesenberry Reference Manual, were they tested for 10 years prior to being suggested by vets? If so, where is that documentation? Where did you get your information saying that it must be tested for that specific period and what agencies is it required to pass through? I don't recall seeing that info anywhere for those diets? I guess a good "estimation" of what is a good diet should be able to stand the test of time. Any diet that can afford gliders a healthy lifestyle could be considered "proven" or "approved" and many people would probably look into what most other use as a bases to choose their diets for their gliders. Personally, I don't see any diet as being "approved". I think it was after this came up the last time that I quit using that term. We don't have any approved diets. How can they be approved?? We still don't know what the recommended daily allowance for protein, fat, sugar, vitamins, etc. are for a sugar glider. Until that information is truly known, we won't truly know if any of the diets we offer are good or doing slow, long term damage. I tend to say the diets are "time tested". I recommend BML and HPW because I know those diets have been fed for many years. Glider have lived long lives on these diets. Now, does that make them the most nutritious diet? Not necessarily. I can eat fast food everyday for many years and still live a long life, but it sure doesn't mean that it's healthy for me. But right now, it's all we have. There is a long list of diets to choose from. We each, as owners, need to decide for ourselves which diet we want to feed. Any diet can be listed as a link on Sugar Glider Help. It has nothing to do with GliderCENTRAL or the Sugar Glider Help staff. Anyone can add links into that database. The true use of that site comes from the public leaving reviews based on their experience. It's all good. I am actually going to have my diet manufactured starting in probably 1-1 1/2 years. I need to find a company that is AAFCO approved for processing raw/frozen diets. I have found one that is willing to work with me, but I want to travel to them to see their manufacturing process and get all of their ingredient sourcing information before going forward with manufacturing. [quote]Please tell me PocketPrincess as you may know since you are doing so much research. Regarding the four (I believe that's the correct number) diets that are listed in the Quesenberry Reference Manual, were they tested for 10 years prior to being suggested by vets? If so, where is that documentation? Where did you get your information saying that it must be tested for that specific period and what agencies is it required to pass through? I don't recall seeing that info anywhere for those diets? That I don't know as I don't have a Quesenberry Reference Manual. I don't know what testing they did prior to release, but I bet they did some stringent testing on their animals. Maybe we should try contacting the vets behind the diets? The only reason I am doing 10 years is that is the amount of time suggested to me by Oklahoma State University and the Oklahoma City Zoo as a good proving ground for long term studies on an animal with an expected 12-15 year lifespan. You actually can sell any diet without going through a government agency, but usually if you don't want legal problems in the future, your sourcing should be USDA approved (not a lot is- actually. It's scary what goes into food! ), FDA does testing on facilities and sanitation, and AAFCO does testing on the levels of vitamins and minerals and they check your labeling to make sure it's correct. You don't have to be AAFCO approved (Answers raw dog food is not), but you open yourself up to lawsuits if anything happens to the animals on your food due to it's not being approved. Thank you for clarification PocketPrincess. It sounded more like you were stating facts in your first post. Now it makes more sense. As far as the diets that are in the Quesenberry vet Reference Manual, I can see about getting that info. I can tell you that they are not any of the more popular diets discussed frequently on any well known forums. I also know that they are diets used at many zoos and in Australia. Some of the diets cannot be properly or easily prepared here with ingredients we have available. Funny, huh? The manufacturing Company IS AAFCO approved and they have to follow ALL the AAFCO regulations and the food IS packaged there, where it is then shipped to Peggy and *she* repackages it. So I don't believe you stating her diets is actual *fact* either. Last edited by tjlong; 01/20/12 08:43 PM. Ahh, but there's the kicker. To be an AAFCO approved diet, it has to be packaged as a final product in an AAFCO approved facility. Like I stated before, they worry about stamping anything AAFCO approved when there is chance of contamination anywhere in the process. You are a food manufacturer (let's say Natura- they manufacture their own products). The facility where you manufacture your food is AAFCO approved. They also package your product. Thus, Natura food is AAFCO approved. However, if you buy a bag of Evo dog food (made by Nautra and packaged in their facilities) and take it home and put it in bags and resell it, then it is not considered AAFCO approved. It's the same food, but they weren't able to test the final product, and who is to say that you did not change something in the food either intentionally or unintentionally. AAFCO is just there to protect the government from lawsuits. They would then be able to say "See! We didn't approve of this food!" and all would be well in Washington. If you can't tell, I'm starting to look into the legal side of pet food manufacturing while I search for the perfect manufacturer. It is my belief that the HPW Plus and HPW Complete can be sent out in the packaging that she receives it in. I doubt most people would want that large of a quantity though. I will shoot her an email and ask. Probably won't get an answer for a week or so. That's not really the topic I wanted to focus on here though! I'm trying to understand why so many people call just a certain few diets "approved"?? ?